And by focusing on social and emotional learning, schools have found student performance increases as they become more likely to learn with understanding, avoid negative behaviors and achieve successful outcomes. Social and emotional development serve as a foundation for student learning and is considered the missing piece of education. What exactly is social and emotional learning (SEL)? SEL is the “process through which children and adults acquire and effectively apply the knowledge, attitudes, and skills necessary to understand and manage emotions, set and achieve positive goals, feel and show empathy for others, establish and maintain positive relationships, and make responsible decisions,” according to CASEL. At Oak Knoll School of the Holy Child, we naturally weave the categorical themes throughout the curriculum, so students are exposed to the methodology and culture each and every day. Adapted to meet the needs of our students, Oak Knoll's curriculum focuses on providing children an understanding and active development of empathy, self-control, integrity, embracing diversity and grit - life success skills. These principles overlap with social and emotional learning and are further reinforced through the seven goals of the Holy Child Network of Schools, which perpetuate the school’s 95-year tradition. We have found that our students, who are equipped with social and emotional learning and life success skills, are overall better students and eager learners. They are the well-adjusted leaders of tomorrow. 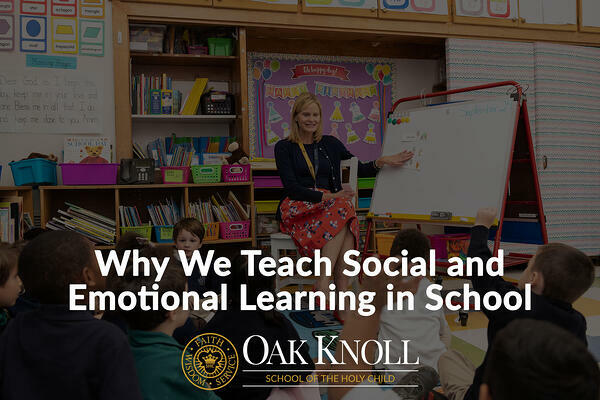 Learn more about how Oak Knoll embraces social and emotional learning and life success skills throughout its high-achievement program.